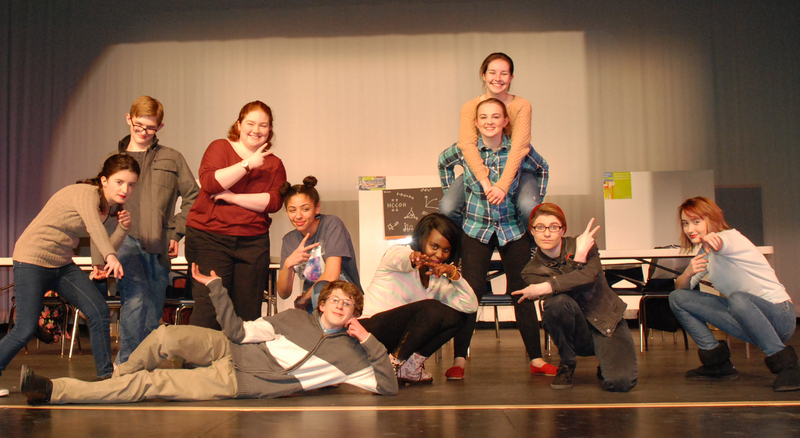 The Rockland High Theater Guild, along with 110 other schools, participated on Saturday, Feb. 27 in a drama festival held by The Massachusetts Educational Theater Guild or METG. The contest had 111 schools from New England competing in order to move on to the next round. “The Massachusetts Educational Theater Guild, Inc. exists for the charitable and educational purpose of promoting and strengthening excellence, access, and education in the theatrical arts for middle and secondary school students and teachers,” according to the METG website. This festival was the preliminaries of the drama contest being held by METG. Winners of this round went on to the semi-final round held on March 19th. “It is an annual competition…for students to perform a one-act play. They have to perform it in 40 minutes and they’re timed by the judges in terms of being able to set up their set and strike their set in 5 minutes,” said Kendra Donovan, one of the advisors of the theater guild, alongside Joanne White, about the conditions of the contest. For their performance, the theater guild performed a play called Heartbeats written by our own Sophie McLellan, a junior at RHS. “The play is about Bethany, a sarcastic, snarky girl who is very closed off to close relationships due to a troubling past. Until meeting Miles, a nerdy, yet endearing, romantic, her only friend was a shy boy named Caleb. In watching their relationship develop, we learn about love, acceptance, grief and many things in between,” said McLellan about the story of her play. She explained that the play took approximately a year to finish writing which is mainly because she had to edit and rewrite the play over and over again in order to make it work for what the theater guild had for actors., Overall McLellan says she is satisfied with how the play turned out. “I cannot begin to tell you how proud I am of the cast and crew. Their commitment and passion during rehearsals was almost as inspiring as their performance at the festival. They evoked true emotion from the audience, and there wasn’t a dry eye in the house. They are an unbelievably talented cast and I’m so honored to have had the pleasure of working with them. They created a beautiful experience and I couldn’t have asked for more. I would have loved better sets, but we didn’t have the money for it. Maybe next year, we can build up more interest and involvement from the theater department!” said McLellan. The play was directed and rehearsed by the students until the time they had to perform at the preliminaries. A position that helps out during these preparations is the stage manager. “A stage manager is the one who queues the lights and sounds… things like that and overall is the one who makes sure the performance can continue smoothly,” said Kimberlie Jean-Poix a junior and the stage manager of the theater guild. Kimberlie feels that the most difficult part of her job is making sure that everything works perfectly and on time. After what they feel was at successful performance their play did not make it past the preliminary round, but even after their loss they are proud of their performance. “There was nothing more rewarding. People laughed, cried, and gave our show a standing ovation at the end. It was amazing talking to audience members and hearing them say that they loved and were touched by my show. Having other directors asking to buy the rights to Heartbeats was surreal. It was an incredible day,” said McLellan.